The Mickey Park combo is one of our Disney inspired favorites. Inside the inflatable there is a large bouncing area with a built in basketball hoop, ladder, a child friendly slide, and colorful graphics. On 3 sides of the combo there are large netted viewing windows so parents can watch over their enthusiastic bouncers. 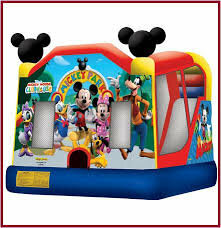 Outside, the inflatable is designed with Mickey Mouse Clubhouse characters including Mickey Mouse and his friends Minnie, Goofy, Donald Duck, and more all in vibrant, lively colors. There are also large Mickey Mouse ears on top of the combo to draw the attention of the little ones from all around. Great for birthdays or public gatherings our Mickey Park inflatable will keep the kids active and having a blast all day.